Despite our best efforts at tidiness, occasionally things still get lost here at the Plastimake Lab. We've been missing the lid to this jar for a while now. It seemed unlikely it was going to show up any time soon, so we made a quick Plastimake replacement. 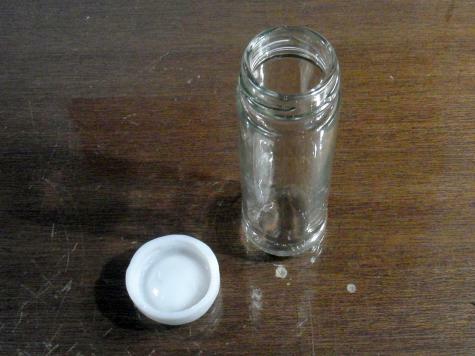 Place a small piece of cling wrap over the opening to the jar. This will stop the Plastimake falling in as it cools. 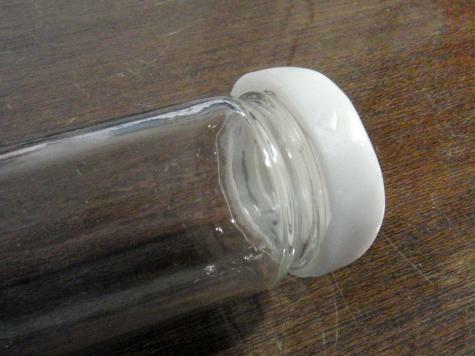 Form a small blob of warm Plastimake over the opening of the jar. Make sure the Plastimake moulds around the thread of the jar opening. Once it has cooled, you should be able to unscrew your new lid. We straightened up the edge of our lid with a Stanley knife. This trick doesn't work every time, some jars have unusual threads which you can't effectively mould around. If your Plastimake lid gets stuck onto your jar, try submerging the whole thing in hot water until the lid softens and can be easily removed. This lid uses 10g of Plastimake.